We are offering a special course at a 30% discount during the month of April: “Confidentiality and Privacy, Including 42CFR Part 2”. This course would be a wonderful addition to your recertification requirements or your initial certification as an addictions professional. 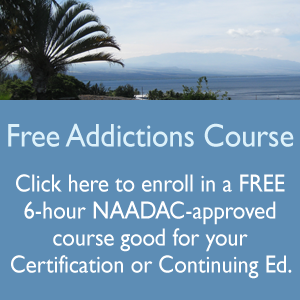 The course is approved by the National Association of Alcoholism and Drug Abuse Counselors (NAADAC) and the Hawaii Dept of Health ADAD. This is a six-hour training aimed at providing an introduction to Confidentiality and Privacy Issues for the addictions professional. Patient Notice/Notice of Privacy Practices Patient rights; Right to request a restriction of uses and disclosures; Right to access PHI; The right to amend PHI; Right to an accounting of disclosures of PHI; Complaints about the program’s privacy practices.